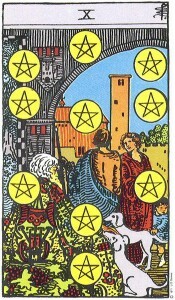 The Ten of Pentacles is a Minor Arcana card, but as a Ten it takes on added significance. Tens are about successful completions of a cycle, and the Ten of Pents indicates that this cycle is about financial abundance and success. 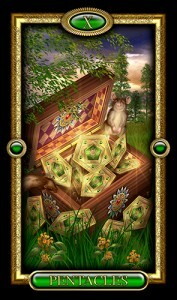 A large reward is in the offing, or a sense of extreme satisfaction and material wealth. You’ve done what you need to earn your reward! If your reading is about health, the Ten of Pents presages a strong constitution; about romance, the Ten of Pents indicates a deep emotional richness to your relationship. In a reading, this card indicates wealth, financial windfalls, job security, strong foundations, abundance and whatever gives you the feeling of rolling around in your bags of mon-eh.